2018 was a remarkable year for the series. For the second year in succession, the leading trio were Colin Tukington, Tom Ingram and Ash Sutton, with a closely fought championship eventually finishing in that order. Despite only taking one win all year, Turkington cemented his reputation as one of the BTCC's all time greats with a third title, to go alongside those he won in 2009 and 2014. All three titles have been won in BMWs. Along the way, the series broke new records - 17 different winners in a single season, and the continued emergence of young stars like Josh Cook, Dan Cammish and Jack Goff alongside the more established names. Matt Neal continued to defy Father Time with two victories, including the special double-distance race at Snetterton. Jason Plato, meanwhile, continued to being MIA - suffering another dismal season and finishing 27th in the standings. Yet, Plato being Plato, there will always be interest in what he does next. Following several ultra-close years, success ballast has been reduced slightly. The maximum ballast a car can carry is down from 75kgs to 54kgs, with the rest being as follows: 2nd: 48kgs, 3rd: 42kgs, 4th: 36kgs, 5th: 30kgs, 6th: 24kgs, 7th: 18kgs, 8th: 12kgs, 9th: 6kgs, 10th: 6kgs. Long time WSR veteran and multiple race winner, Rob Collard, has lost his drive. It's not clear whether he'll remain in the BTCC, or move to British GT. He has been replaced in the team by second year returnee Tom Oliphant, who recorded a best finish of seventh in 2018. HMS Racing, which ran Rob Austin in a new Alfa Romeo Giulietta this year, will take a year out from the series after failing to secure a budget. They have stated their desire to return for 2020. It's not clear at this stage whether Austin will return with another team. Similarly, Eurotech, which enjoyed its most competitive season since change of ownership, has sold its TBLs and will not return in 2019. Double race winner in 2018, Jack Goff, has not yet confirmed his plans for the new season. 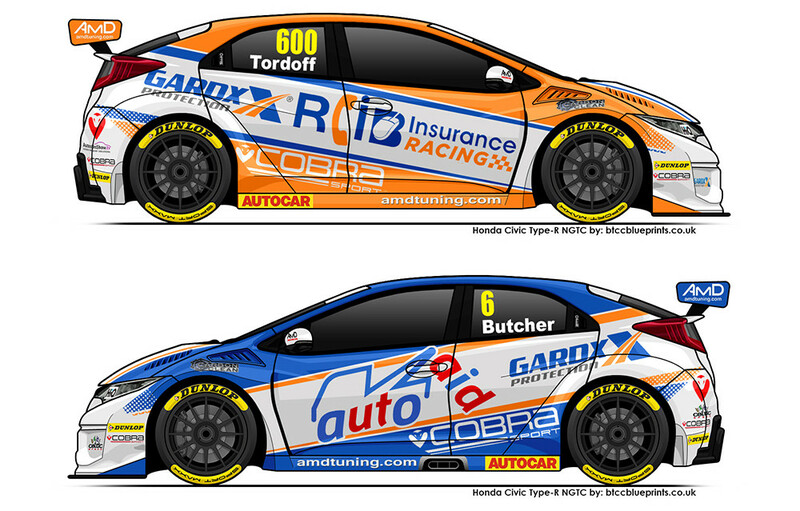 After making his return to the series this year, Sam Tordoff switches to AmD - which has purchased Eurotech's Hondas. His team mate will be Rory Butcher, who had some strong races in the uncompetitive MG this year. Jake Hill makes a welcome return to the series, driving one of Trade Price Cars Racing's Audi S3s. A typically crazy BTCC race - with a result that comes from out of nowhere. Worth it for the last lap battle, and incredibly close finish. The last race of the year - you'll struggle to find a finer battle between two leaders in any other series. So, what was your highlight from this season, and what are you looking forward to in 2019? Anyone brave enough to make a prediction for the championship? Edited by JHSingo, 22 December 2018 - 01:34. I was cheering on Ingram, but Turkington showed just why he's an all-time great because that championship trophy should not have been in his hands come the end of the year. But (Knockhill controversy aside) he drove THE perfect season, textbook "how to win a championship when there are faster packages out there" and much as I'd have given a lot to see Ingram crowned instead, it was deserved. Enjoyed the Subaru saga too because it brought out the absolute best in Ash Sutton. Why Plato is still there is beyond my understanding now. But seeing Sutton launch himself back into title contention by just winning, winning, winning, was thrilling really. Again, if he'd managed to win the title then there'd have been no arguments from me at all. Think 2019 will be great, but I'm doubting it'll be quite as open. Because Subaru have sorted themselves out now so we won't see Sutton giving his rivals a massive head start, Honda have had time to develop the new Civic and Cammish is fully up to speed, I reckon those two teams might be at the forefront and the unknown factor of the new Toyota. Will the old shape Civics and the BMWs still be as competitive another year on? Will Turkington still be on the grid? If I was going for one guy to win in 2019 it'd be Sutton but watch Cammish go too. I say this before pretty much every BTCC season. Can it really be as good as the one before? I don't see how 2019 can be better than 2018 but this is the BTCC and it always produces something special and spectacular. Heart says Ingram, Head says Sutton. I also would love to see Mat Jackson get a drive, but don't know if there is any chance of that. The BTCC has been consistently exciting for so long now and I'd expect no less next year. I'll definitely try to get myself to one of the Thruxton dates too. The championship is my first choice for guaranteed action at every race. I think we'll look back on these years as one of the golden eras for the series. I understand that Rob Collard has had his BTCC day.especially after his post-accident concussion. But his lad Ricky made a stellar substitute and WSR really ought to have hung on to him. BTCC needs bright new talent like Ricky. But instead they sign Oliphant? Why?? ££££ is the only possible reason. Ingram is overdue a title, but I can't see him winning one in his team's first year with a new car. I think that either Turkington or Sutton (or even both) could move on next year. If not, I would expect the championship to be between them, Cook and Cammish. Finishing 23rd every race in a Subaru Levorg, I guess. Turkington will defend his title with WSR. Would've been very surprised if that hadn't been the case, but good to have it officially confirmed all the same. Autosport being cheeky with the "Jackson Joins Chilton at Motorbase" headline today. It's Ollie Jackson alongside Tom Chilton, not a returning Mat. Also news that the canned-for-2020 Clio Cup will be replaced by the Mini Challenge. The Mini series, whenever I've seen it, doesn't seem to produce quite the level of inspired lunacy of the Clio Cup. Whether that's down to car or drivers I don't know. Am sad Collard Sr is gone, really gonna miss him on the grid this year, but I can understand and respect his decision to step down. As for Collard Jr, he is contracted by BMW Motorsport, while it would have been nice to see him take over dad's mantle, but I guess his programme with BMW this year may be more demanding to fit in a BTCC Season. Anyway, I did chuckle at Motorbase's quip "The original Jackson returns" make of that what you will ;) and Ollie Jackson fully deserves his chance. But.... I'd love to see Matt Jackson back this year! here's hoping. Anyone heard any news on Jason Plato? Chris Smiley remains with BTC Racing. Nic Hamilton takes the final Motorbase seat, with Rokit sponsorship. Surprise! Former F1 driver Mark Blundell will drive a Trade Price Audi, alongside Jake Hill. Yeah Steve, that is a good fing what has happened. ...that’s a bit left-field. When did he last race full-time? Edited by Frood, 13 February 2019 - 08:16. He gone done got a drive! British GT in 2013, according to the Autosport article. I'd be amazed if he lasted the season. I look forward to his battles with Plato over 29th. Interesting that in the week where it is announced that Nic Hamilton and Mark Blundell (only a handful of F1 seasons and Indycar wins to his name) are joining the BTCC for 2019, it is Marks ability that is being questioned. I think everyone is fully aware of how and why Hamilton gets his drives, what his limitations are and what we can expect from him. Blundell, though? I genuinely don't know why he's here or what he can do. That haven't been many drivers announced so far who you could say are there on ability alone. It seems despite the series being in rude health the teams (outside of the works efforts) are still struggling financially hence the balance being tipped towards more pay drivers. Oh don't get me wrong, I do 'get it', but personally, I find Blundell being in the series quite fascinating, and will be very interested to see how it pans out, good or bad (likely to be the latter, granted). If nothing else, we can go back to watching those captivating exchanges between him and Steve Rider. Edited by DS27, 13 February 2019 - 14:51. While there are more posts on what Rich Energy is? Answers on postcard on that one! AMD have made a statement of intent and made quite a coup in securing 4 very capable drivers on delivering their desire to step up to the big time in the BTCC, Lets face it, all and sundry (myself included) would have thought Butcher would be off to pastures new and a so called better team after his heroics in the MG last year. But ever the true Scotsman, Loyalty wins over. Loyalty to a team that gave him his first full season and its only fair he should reap the rewards.. Personally for Shaun and his little AMD crew, I have nothing but admiration, to secure such a talented spectrum of drivers should be applauded. Ollie Jackson offered glimpses of hope for that Audi could do. If your Jake Hill, why would you not love a Le Mans 24hr winner IndyCar/CART winner, F1 podiums and all that as your team mate? its these guys that can open doors for you if you. respect your elders as they say! Edited by BMWTeamBigazzi, 14 February 2019 - 02:11. Josh Cook will drive a Honda Civic alongside Smiley at BTC Racing. So no Goff, Lloyd, Austin, Jackson or either Collard so far. The quality of the field seems like it could be weaker this year. And Honda are closing their Swindon plant in 2022. Sadly, Brexit will cause serious damage to the championship. Mainstream media is using it as the blame for everything, if people looked a bit deeper they would see the whole European car industry is in serious trouble. I don't think we will see Collard racing again, that injury last year has probably finished him as a full time driver and his son Ricky has higher ambitions, Mat Jackson has finished his career after whoring himself to Honda, its a small paddock after all, Rob Austin has already said they are skipping this years championship hopefully he can get something sorted for next year, be a shame if Jack Goff and Dan Lloyd switched to another series but the championship is in great health. In other news, BMR are releasing news at 6pm. Sadly, Brexit will cause serious damage to the championship. It won't, but if it did, it would be a sacrifice well worth making for our freedom, independence and sovereignty. Who is left to announce drivers? Team Parker? BMR? Excer8? Powermaxed? I have a feeling JP has left BMR, possibly even BTCC altogether. When it was announced that Blundell was competing this year, Jason tweeted that he was looking forward to WATCHING him produce the old magic. I could be reading far too much into that statement, but given the announcement of Proctor joining BMR, it is a real possibility. Plato to Power Maxed Racing to drive an Astra. Hopefully this means that Sutton will still be in the other BMR seat. I think that is the obvious choice which makes them a strong partnership, hopefully the car can be better than last year. Good move for Plato and for Vauxhall to rekindle an old partnership, lets see how he goes, I wouldn't be surprised to see him back at the front of the grid again. Still going for those 100 wins eh! God, I would. People say Kimi has been pottering around well past his prime for too long but Plato is something else entirely. Trundling round finishing 23rd while his team-mate was winning races, for two years straight. I'd be amazed to find him competitive again. As predicted BMR and Subaru have confirmed Ash Sutton to partner Senna Proctor. Such a bloody shame Jack Goff can’t get a drive. I would have thought with Goff’s talent and personality he would get in easily. Do most drivers literally pay out of their own pocket to drive in BTCC? Glad Sutton was retained at BMR. Plato going to Power Maxed is surprising. It's a shame to see so many names being confirmed as not being involved this year. I hope we aren't seeing the beginning of another slump for BTCC. Sadly I’d put the number of pay drivers in the series at probably 75% which is a sad state of affairs when you consider the popularity of the series. The factory drivers are obviously there on the merit but there’s not many of them, after that there’s still those who clearly deserve to be there but have to bring a “package” to get a drive. I’d say the last third of the grid are really only there because of their £££ and to literally make up the numbers. If Gow culled 10 cars off the grid from the back they wouldn’t be missed.